You can read about it in 10 minutes. Living it can feel like a lifetime. 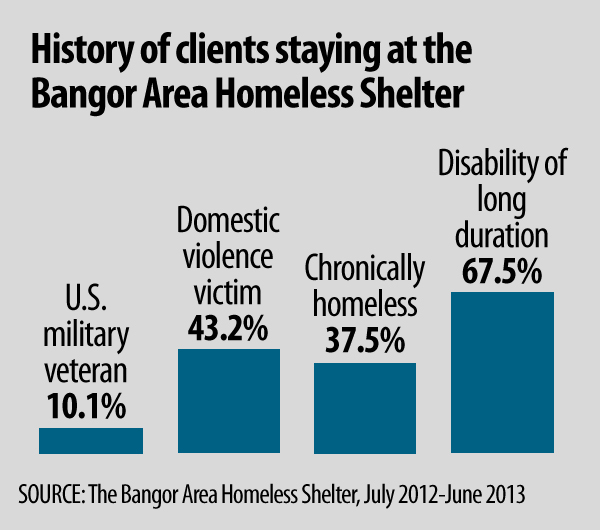 Bangor Daily News staffers Erin Rhoda, Nick McCrea and Brian Feulner chronicled the stories of Maine's homeless in a 24-hour stay at the Bangor Area Homeless Shelter in September. 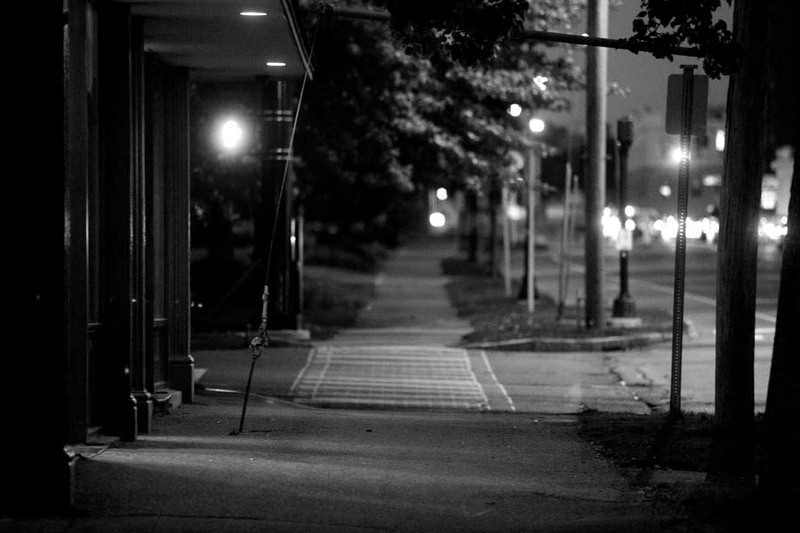 Homelessness feels like a type of purgatory. Even though you might be surrounded by people, you feel isolated, anxious. There’s no place to claim your own, to rest. Jeanie Perkins follows along with the Bible while listening to it on a CD player before going to bed at the Bangor Area Homeless Shelter. We met Jeanie Perkins, 54, of Houlton, during an overnight stay at the Bangor Area Homeless Shelter on Friday, Sept. 13. She was in the shelter because she chose to leave violence in her home five months prior. Though she stayed with a friend for a little while, she didn’t want to be a burden. So she lived in her car for two months. She was so alone. In 2011, her brother died. Her mother — whom she described as her best friend — died a little more than a year ago. Jeanie described herself as having a “soft heart.” It’s hard for her to hear stories of what has happened to other shelter residents, she said. She aches for them. Before she goes to bed she prays for each person there. She said if she won the Megabucks she’d build a brand new shelter, so everyone could have their own room. She had been at the shelter three months, waiting for housing. None of us is far from homelessness. One layoff. One foreclosure. One weakness that leads to addiction. 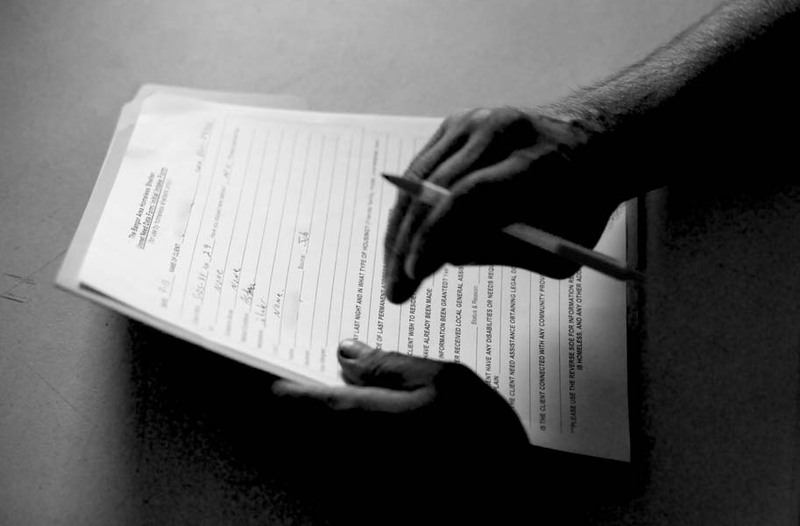 Shelter aide Rodney Knox fills out an intake form. If you’ve exhausted your options with friends or family, you nervously walk into a shelter filled with strangers. A staff member sits you down and asks you questions about your past — substance abuse, mental illness, work history, criminal history, medications. Nothing is out of bounds. The people we met were all different. Some were scared and confused. Some were hopeful, others distraught. Many residents may have had developmental issues, criminal histories and addictions, but no one is identified solely by his or her problems. Some woke up at 4 a.m. to go to work. One was a college student. How many people in your life are homeless, and you don’t know? Rodney Knox and Shannon Denbow, both shelter aides, welcomed us when we arrived at 8:30 a.m., as if we were truly homeless. If we hadn’t been there for work, we clearly would have been rejected. The shelter turns away people who have other options. Rodney went over the rules: We had to have a plan for leaving the shelter; no tobacco or alcohol were allowed; no electronics like cellphones or computers were allowed; curfew was at 10 p.m.; we had to do daily chores; we had to be present by 5 p.m. if we wanted a bed. There was more paperwork. Had we experienced domestic violence, been in a foster or group home, or been committed to a psychiatric hospital? Were we hearing- or vision-impaired? Did we have a “disabling condition of long duration”? Filling out the paperwork took about two hours. 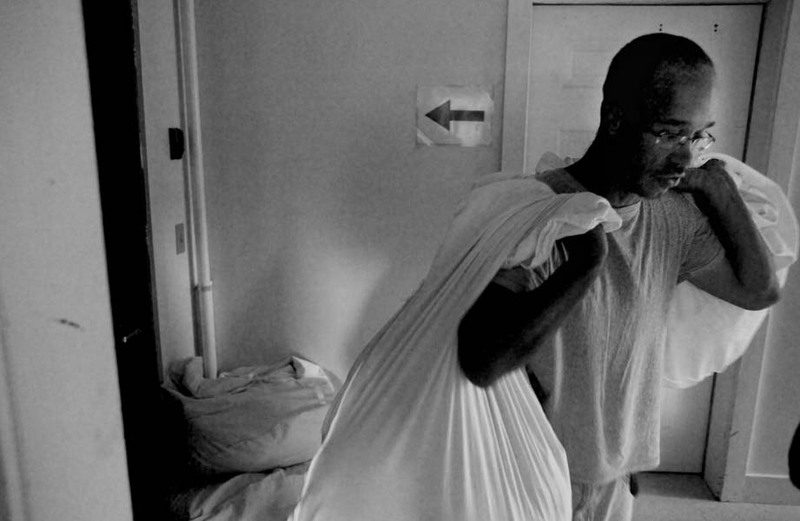 Charles Hammond Jr. helps to carry laundry bags up the stairs at the Bangor Area Homeless Shelter. “Everybody’s got a struggle. Ain’t nobody perfect,” said Charles Hammond Jr., 35, a shelter resident who sat nearby. What’s his struggle? Alcohol. “It’s cost me a lot,” he said, including his job as a dishwasher and then his apartment. He sees people driving cars, going to restaurants, and questions if they realize what they have. He wonders if they could survive for a week on $20, walking around Bangor in the rain, in wet shoes and socks. 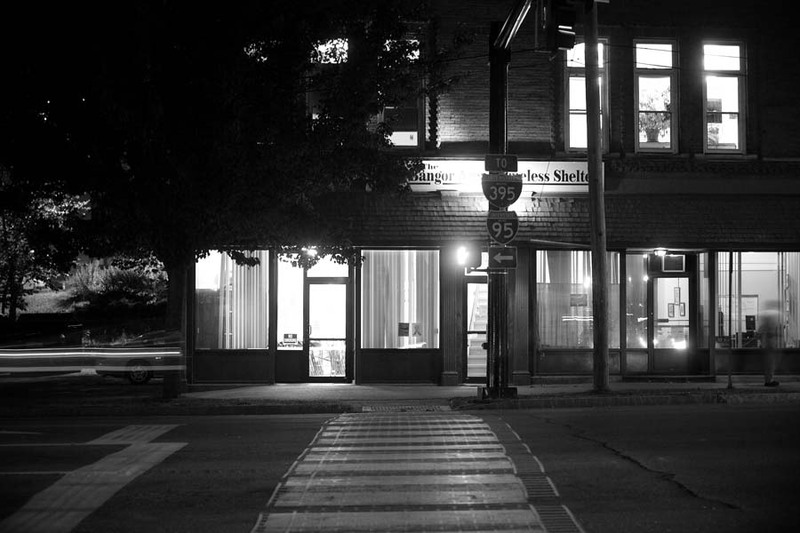 The exterior of the Bangor Area Homeless Shelter at night. Kenny Chase, a peer support specialist at Community Health and Counseling Services, walked in a couple minutes before holding his regular 10 a.m. Alcoholics Anonymous meeting. It’s possible for people to manage their addiction if they want to, he said. He’s proof. For six years, from 1988 to 1994, he lived on the streets of Bangor, describing himself as a “hard-core alcoholic.” But he said he had a spiritual change and started going to meetings. He’s been sober since July 13, 1996. For people struggling with addiction, it’s important to take it slow. He tries to build trust and hope, he said. 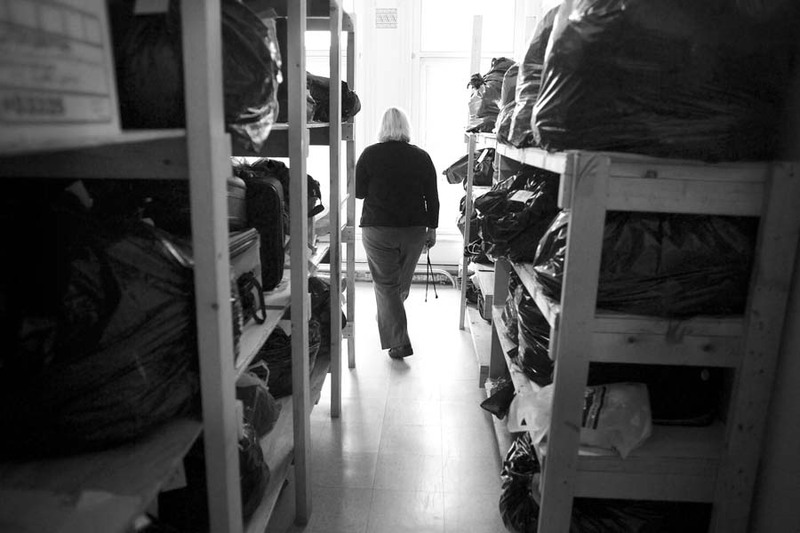 Program Manager Rowena Griffin walks through shelving that contains bags of belongings that some of Bangor's homeless have left at the shelter. The biggest reasons why people become homeless are poverty and lack of access to affordable housing. Neither shows major signs of improving. The percentage of people living below the poverty line hasn’t changed much: It’s fluctuated between 10 and 15 percent for nearly 30 years. At the same time, housing costs have increased at faster rates than incomes over the last decade. As for rental units, in 2010 there was only one county — Sagadahoc — that scored well on the state’s rental affordability index, according to the Maine State Planning Office. 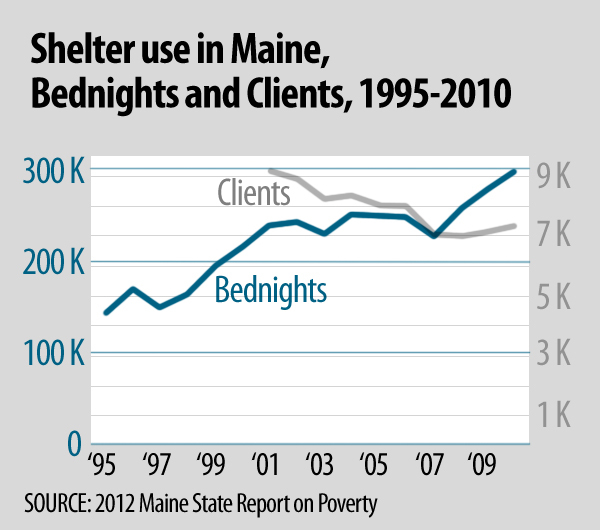 Lack of affordable housing means more people are at risk of being homeless. Rental subsidies do play an important role in keeping people in stable housing, but the need is greater than available resources. 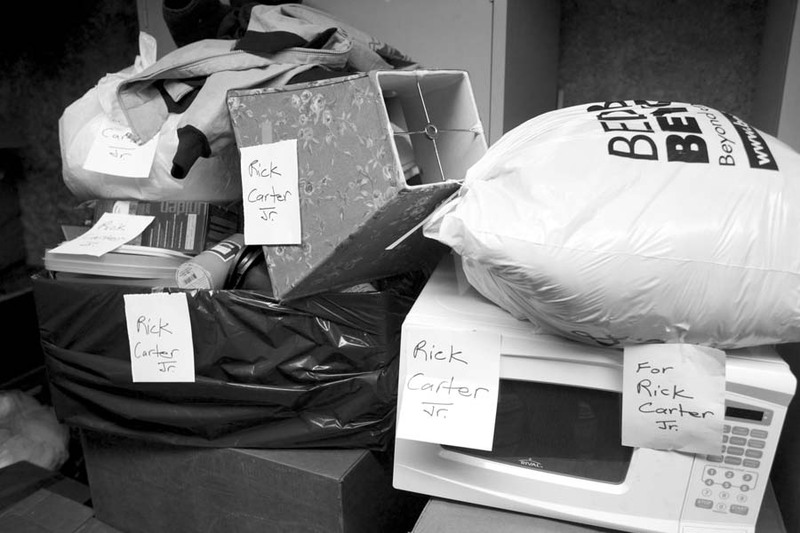 The shelter needs belts, socks and underwear in original packaging, men's XL and larger T-shirts, pants, flip flops, non-prescription glasses, backpacks. Dan Cohen is a targeted case manager who works with residents at the shelter. His overall goal is to get people housed. It’s a challenge. Despite the fact that shelters should be used for triage, the wait time for a homeless person to get a voucher for Section 8 housing usually takes months, he said. 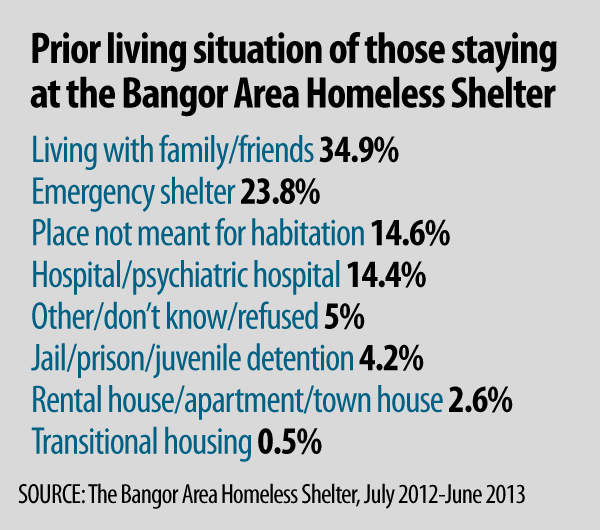 Experts largely know what helps people recover from homelessness. 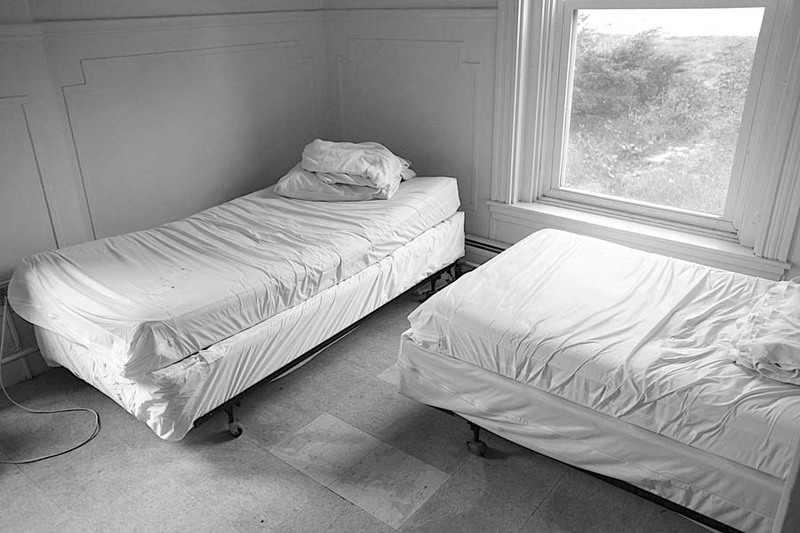 Rapid rehousing — where the first priority is to get someone housed instead of first mandating they attend certain programs for their addiction or mental illness — has worked under Presidents George W. Bush and Barack Obama. Volunteer Wayne Gagnon prepares lunch for guests of the Bangor Area Homeless Shelter. Lunch is noon to 12:30 p.m., and it’s not bad — leftovers from Hollywood Casino. The shelter receives donated food from the casino, in addition to Hannaford, Panda Garden and other area businesses. It is given plenty of donated bread but is often low on milk and butter. It also runs out of toiletries like razors and shampoo and certain items of clothing like socks and underwear. While we ate, a tall, thin man sat down across from us and talked nonstop. When he was done with his meal, he folded his plate around four whole Roma tomatoes and tucked it into his sweatshirt. Dinner, from 5 to 5:30 p.m., was green chile chicken enchilada casserole, made by Lance Dana, 42, a shelter resident. Residents told him how much they liked it. 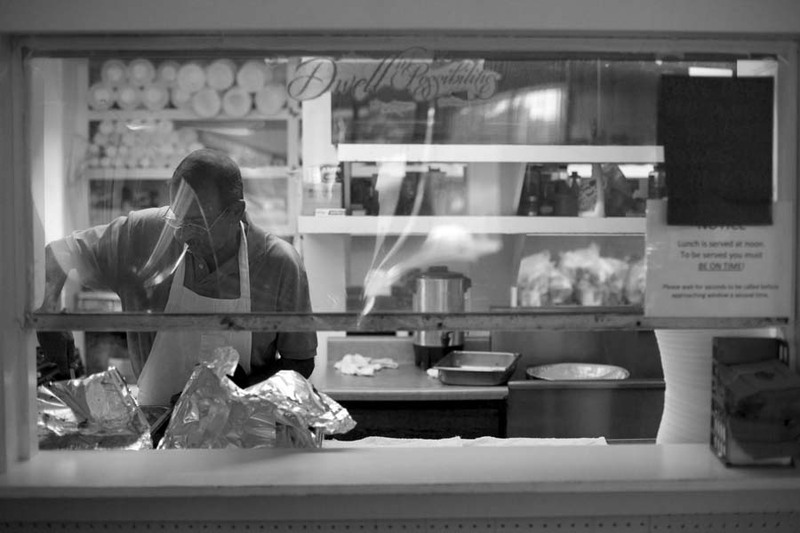 Lance Dana helps prepare food at the Bangor Area Homeless Shelter. Lance was born in Maine but moved to New Mexico when he turned 21. He blames alcoholism for periods of unemployment and homelessness in his past. He came back to Maine after his house in New Mexico failed a code inspection, he said. He planned on raking blueberries, but the work didn’t pan out. He ended up without a place to stay and came to the shelter. 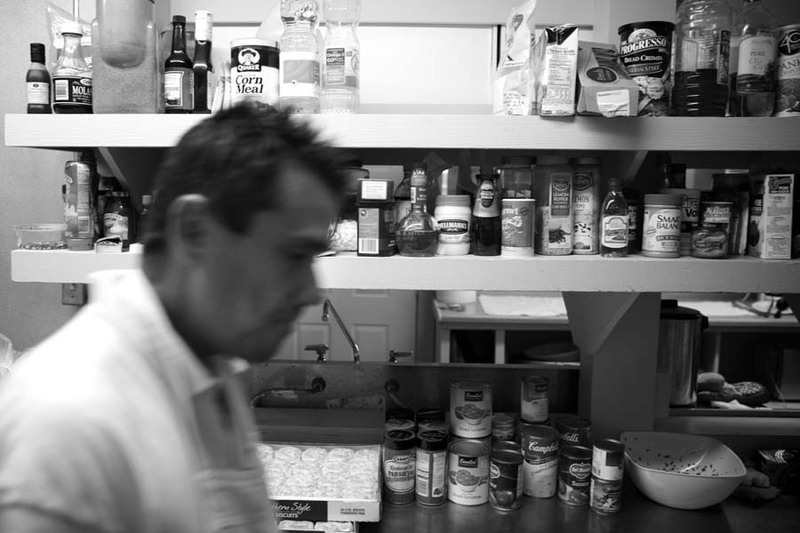 He volunteers to cook and clean at the shelter because he said he doesn’t like taking anything without giving something else back. Cooking, cleaning and keeping busy help him to forget that he’s homeless, if only for a few minutes. During dinner Erin sat with a shelter resident who shared stories of Maine. Finally he said he had to go. He’d heard a flight of troops was coming in to the Bangor airport, and he wanted to greet them with the Maine Troop Greeters. Lance Dana sits in the TV room after dinner. At night people gathered in the TV room upstairs, sitting in the battered sofas and chairs. One resident was reading Stephen King’s “Insomnia” and mentioned how he couldn’t sleep. People joked with one another and tried to answer the Jeopardy questions flashing on the screen. More and more people filtered in, smelling of soap. Everyone is required to take a shower before bed. Their socks were the kind with little rubber sections on the bottom, to prevent them from slipping. It was good to know they were safe, that they didn’t have to sleep in a car in some dark corner of a parking lot, like Jeanie did for too long. Before she went to bed, Jeanie read the Bible and followed along with an audio recording. Sleeping wasn’t easy. The Avett Brothers played at the Waterfront Concerts nearby until 11:30 p.m. The plastic on the beds crinkled, and traffic whooshed by outside, stirring up the rain on the pavement. Someone snored. Some woke up at 4 a.m. for early shifts at work. Everyone else had to be out of bed by 6 a.m.
More than anything we were relieved to go home, that we had homes. The newly risen sun shone above the river and below a line of clouds, trapped for a moment between two worlds. Have items you’d like to donate? 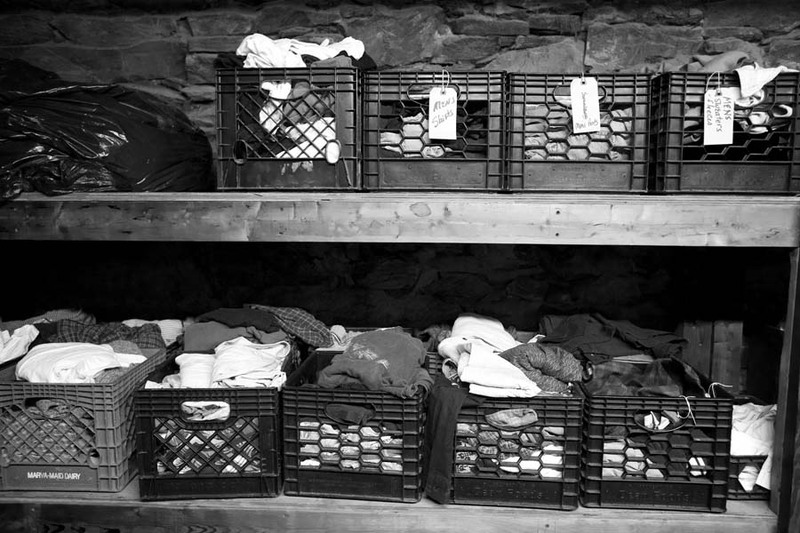 The Bangor Area Homeless Shelter is always accepting clothing, food, cleaning supplies and donations. 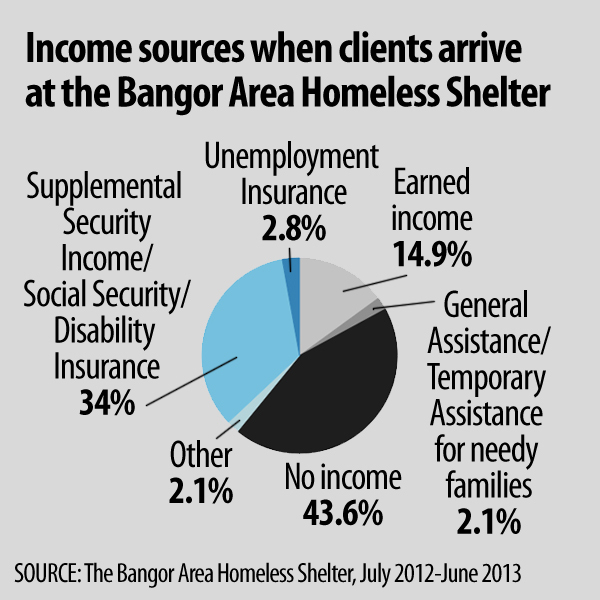 It’s located at 263 Main Street, Bangor, ME, 04401, and may be reached at 947-0092 or info@bangorareashelter.org. The BDN would like to thank the residents who shared their personal experiences and the professionals who work daily with homeless Mainers. This project would not have been possible without them.